Members of the media and local food aficionados gathered yesterday outside of Brooklyn Borough Hall to witness the official announcement that the world's largest rooftop farm will be coming to Kingsborough. Brooklyn Borough President, Marty Markowitz, Congresswoman Nydia M. Velázquez, Congressman Jerrold Nadler, and celebrity chef Mario Batali were all there to lend support as Brightfarms CEO Paul Lightfoot broke the news and tore a white drape off of a rendering of the future 100,000 sq. ft. farm. We got the chance to speak to Mr. Lightfoot after his speech and pick his brain about when the farm will be completed and how the development will change the way New Yorkers eat. Read on to see what he shared with us. Brooklyn Borough President Marty Markowitz donned a pair of bright blue Crocs to match celebrity chef Mario Batali’s for the event. Lightfoot introduced Brightfarms’ plan for the world’s largest rooftop farm with help from his adorable daughter Amelia Independence Lightfoot. “We are what we eat,” he said, and described how he wished only the best, freshest food for Amelia so that she can grow up healthy. He also spoke about how children love to see where their food comes from and that everyone deserves to know exactly how and where their food is grown – a prospect that the new rooftop farm in Brooklyn will make possible for many New Yorkers. The CEO went on to describe how Brooklyn used to be one of the most significant agricultural counties in the United States (we had no idea), and expressed his hope to bring that title back to Kings County. “Every million dollars in local food sales supports 13 jobs,” he said, citing another reason why local is better. He also reiterated the most obvious reason local produce is more desirable than fruits and veggies shipped across the country – “produce is less tasty and less nutritious” when it’s been sitting on a truck for days. INHABITAT: When do you anticipate the farm will be done? Paul Lightfoot: Assuming the city’s approval process goes as we expect, we will begin construction in the 4th quarter of this year and open the farm in the 1st quarter of 2013. We don’t want dust to settle – we’re moving. INHABITAT: Are you considering creating more farms on other industrial buildings in Brooklyn? Paul Lightfoot: We will absolutely do more projects in Brooklyn. INHABITAT: Can you tell us a little bit more about the types of fruits and vegetables that will be grown on the farm? Paul Lightfoot: On this project we expect to be growing several lettuce varieties, several tomato varieties and several herb varieties. We’ll have grape tomatoes, tomatoes on the vine and cocktail tomatoes. And they will be the best tomatoes that Brooklyn’s ever had. A local tomato grown with care is on a different planet than a supermarket tomato. You can taste the loving and the difference. INHABITAT: You mentioned a grocer partner. Has that party been decided yet? Paul Lightfoot: We’re talking to several right now but I can’t disclose yet which they are. But yes, it will be one exclusive partner. As New Yorkers, we’re eagerly the opening of the farm ourselves and will keep you up-to-date with the latest news as well as photos of the reveal in 2013. So stay tuned! Lightfoot introduced Brightfarms' plan for the world's largest rooftop farm with help from his adorable daughter Amelia Independence Lightfoot. 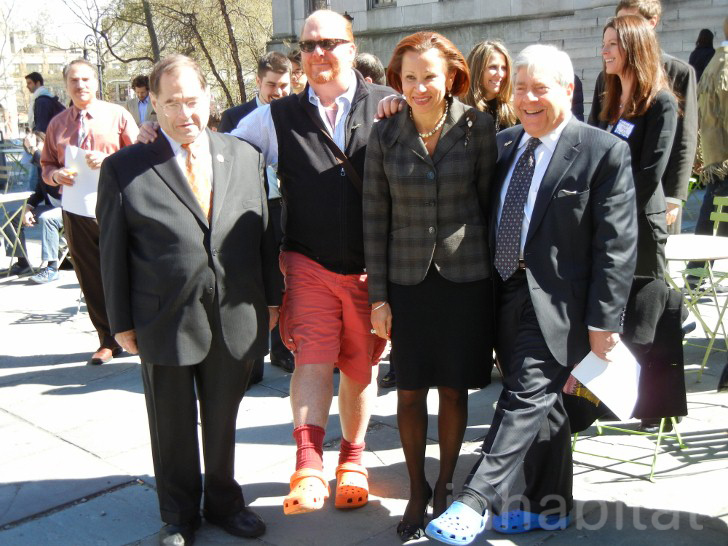 Brooklyn Borough President Marty Markowitz donned a pair of bright blue Crocs to match celebrity chef Mario Batali's for the event. "We are what we eat," he said, and described how he wished only the best, freshest food for Amelia so that she can grow up healthy. He also spoke about how children love to see where their food comes from and that everyone deserves to know exactly how and where their food is grown - a prospect that the new rooftop farm in Brooklyn will make possible for many New Yorkers. The CEO went on to describe how Brooklyn used to be one of the most significant agricultural counties in the United States (we had no idea), and expressed his hope to bring that title back to Kings County. "Every million dollars in local food sales supports 13 jobs," he said, citing another reason why local is better. He also reiterated the most obvious reason local produce is more desirable than fruits and veggies shipped across the country. "Produce is less tasty and less nutritious" when it's been sitting on a truck for days, said Lightfoot. Paul Lightfoot: Assuming the city's approval process goes as we expect, we will begin construction in the 4th quarter of this year and open the farm in the 1st quarter or 2013. We don't want dust to settle - we're moving. INHABITAT:Are you considering creating more farms on other industrial buildings in Brooklyn? Paul Lightfoot:We will absolutely do more projects in Brooklyn. INHABITAT:Can you tell us a little bit more about the types of fruits and vegetables that will be grown on the farm? Paul Lightfoot:On this project we expect to be growing several lettuce varieties, several tomato varieties and several herb varieties. We'll have grape tomatoes, tomatoes on the vine and cocktail tomatoes. And they will be the best tomatoes that Brooklyn's ever had. A local tomato grown with care is on a different planet than a supermarket tomato. You can taste the loving and the difference. INHABITAT:You mentioned a grocer partner. Has that party been decided yet? Paul Lightfoot:We're talking to several right now but I can't disclose which they are. But yes, it will be one exclusive partner. Marty Markowitz expresses his happiness that the world's new largest rooftop farm will be in his borough. The press conference was followed by a sampling of delicious local foods and vendors from Brooklyn, including Mama O's Kimchee.